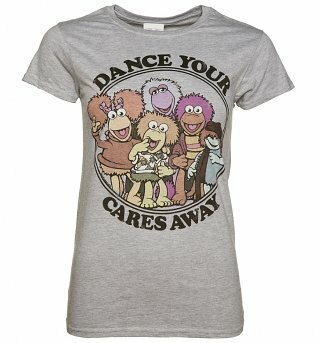 Customer Reviews of "Women's Fraggle Rock Dance Your Cares Away T-Shirt"
Love the t-shirt perfect fit. I am normally a 12 to 14 so large fits great. Love this shirt! I'm a medium built woman with broad shoulders so I ordered a size large in women's and was very happy with it. Good quality and the image on the shirt is great. Also very comfortable. Great tshirt, good quality. It’s a little snug compared to others of the same size but still comfortable. Great selection, very hard not to buy a lot more tshirts. Easy ordering, arrived quickly. TruffleShuffle has an awesome selection of unique and cute products! I had so much fun picking out retro and modern fandom items to give out for Christmas presents.The international shipping was way faster than I expected.Overall, a great shopping experience. Superfast delivery, arrived the day after I ordered. No complaints. Who doesn't love the Fraggles?! Awesome t-shirt, my sisters are jealous! Great fit and cheers up other people when I wear it. Loved Fraggle Rock as a child! Great tshirt. Great quality, sizing is accurate, and overall very impressed.